How is a cartoon born? A question which few people are able to answer. Code Lyoko had a standard yet rough beginning. 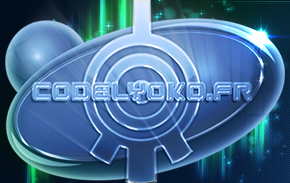 Two names continually resurface as one studies Code Lyoko: Thomas Romain & Tania Palumbo, both credited as the "original creators" of the project. However, in the credits scenes, only the name of Tania Palumbo is evident and can be seen titled as artistic director for the four seasons of Code Lyoko. No trace exists of Thomas Romain whose name is limited to the graphic and literary bible. What has happened to this name? And just who are the ones hiding behind the title of "original creators?" What are "Les enfants font leur cinéma" and "Garage Kids?" All of these answers are here. 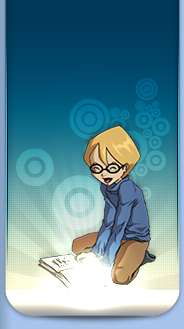 This page will lift the veil from the origins of Code Lyoko. To its sources: "Les enfants font leur cinéma"
Everything started with the dawn of the third millenium. In the year 2000, a group of students from the school of Gobelins in Paris (the center for cinematic schooling) were to create their final class project. This year, a group of students composed primarily of Tania Palumbo and Thomas Romain, passionate about Japan, complete their project; it is titled, "Les enfants font leur cinéma." Tania Palumbo and Thomas Romain were students in animation (the Gobelins school offers various courses, notably in scriptwriting). As a result, their project heavily focused on creating an artistic universe with a visual ambiance. At the time, there was not even a trace of a script. The short film "Les enfants font leur cinéma"
This project would only be able to remain a few seconds of anonymous animation stored away in the archives of the Gobelins school. However, the work of the Gobelins students was presented as usual at the International Film Festival of Annecy in 2000, an event attracting professionals in the world of animation. There, the project was noticed, and Tania Palumbo and Thomas Romain started to receive offers from audiovisual creators. The project evolves: "Garage Kids"
"Garage Kids" is generally considered to be the pilot to the series, which is both true and false. 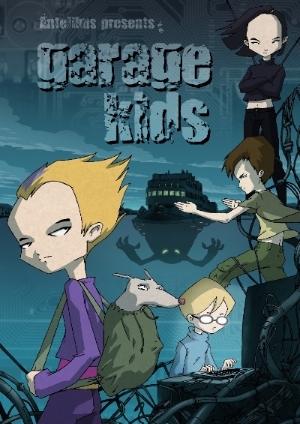 Garage Kids was initially to be the pilot to a series that would been formed from it as a base. Here is the video of Garage Kids, or rather the original concept of Code Lyoko as it had been conceived by Tania Palumbo and Thomas Romain. However, when Garage Kids was presented and adopted by Antefilms Studio at the time, a lot of work was put into updating the concept and its elements were heavily modified. In reality, Antefilms Studio was mostly interested in the visual universe of the series and its base concept: the virtual world run by a supercomputer in an underground factory. Starting from this base, the Di Sabatino brothers (current managers at Moonscoop) wished to develop the "video game" aspect. That had several impacts on the animated series and its concept. 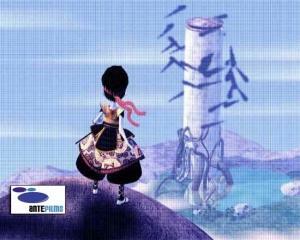 -	The major change that occurred was the use of 3D for scenes in the virtual world that were initially envisioned in 2D. -	There needed to be a clean dividing line between the real and virtual world so that the youngest of viewers would understand that the video game side was not the real side. The transition between 2D and 3D created this line. Yet plot-wise, their powers were limited to the virtual world, even though in Garage Kids, the heroes also had their powers on Earth. 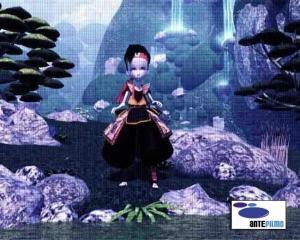 -	Next, the characters Aelita and XANA were created alongside the rest of the concept of Code Lyoko. -	The final point: Garage Kids was meant to progress as a story. It was intended to have a progression in the series during which the characters would discover the virtual world and its secrets over time, similar to the progression of season 4 and its exploration of the network. However, this formula is risky in the world of animation, because it becomes harder to win over "the viewer." A viewer who would discover the show in the middle of its story would feel lost. So, the basic scriptwriting found in season 1 was chosen instead: a repetitive scenario with little to no plot progression that could be viewed in any order. It was this accumulation of stumbles and disagreements between the production team and Thomas Romain that ultimately caused him to leave the project during 2003, even though the first scripts had just started to be created. The project went on without him. So, Thomas Romain left France to live his dream of becoming an animator in Japan where he refocused himself on his second project: Molly Star Racer which evolved into Oban Star Racer. Meanwhile, Garage Kids evolved into Code Lyoko. Such is the reason why the credits of Code Lyoko feature Thomas Romain solely as the creator to the graphic and literary bible, while Tania is also shown as artistic director. 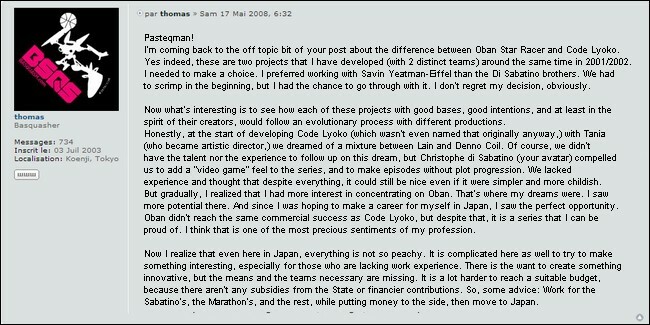 We found these explanations given by Thomas Romain on his withdrawal from the project of Code Lyoko. These posts were made on the Catsuka.com forum, a vast forum dedicated to animation in general. We are relaying his posts to you here, so that you can better understand his reasons for leaving the project. A post from the administrator of the forum speaking of Thomas Romain. A post by Thomas Romain on the difference between Oban Star Racer and Code Lyoko, and a word on the difference between animation in France and in Japan. 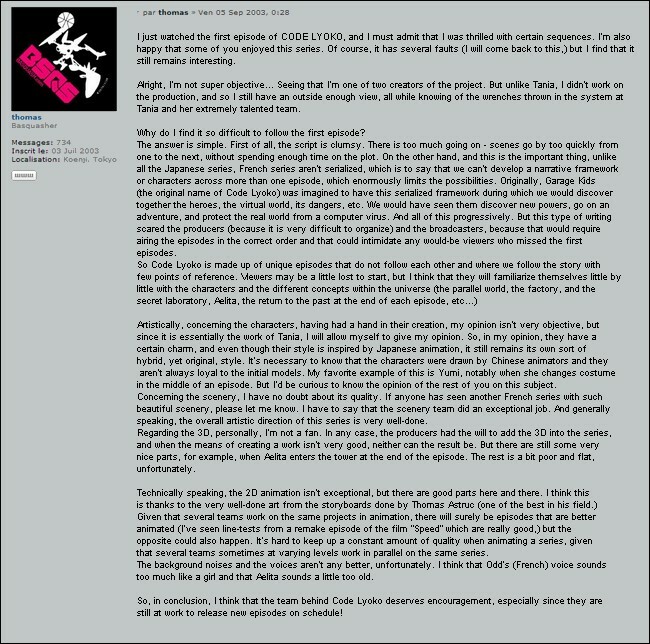 About the debut of Code Lyoko and its pilot episode, "Teddygozilla". View the full gallery of images!